The "Boot Rule" - How Have Things Changed? Jamie Dieterich, Rules Interpreter, describes how rule changes over the past few years allow competitors a few more options for their equines "footwear:"
The boot rule was changed a few years ago to allow gaiters and attachments above the coronet. One key aspect has been whether the extra "parts" or attachments are an integral part of the boot, necessary for its function of protecting the sole, or if they are "accessories" and thus leg protection, which is not allowed. In practice, this distinction between "allowed" and "not allowed" was very hard to make and has caused frustration among rules interpreters and riders alike. In considering the initial change to allow attachments, straps and gaiters for hoof boots, most of the Judges Committee believed that any type of hoof boot conferred minimal, if any, competitive advantage. Likewise, many think there is there is no competitive advantage in using an optional sock or wrap under a boot or gaiter, and that trying to make the distinction is splitting hairs. The most recent change is to allow socks or wraps under the hoof boot or their parts, which gives the rider more options to choose what works best for the horse. There are no shoeing restrictions. All types of hoof boots that provide sole protection are allowed. However, any attached strap, keeper, gaiter, or accessory must not extend above the pastern. Socks and wraps under hoof boots or any of their parts are allowed if they do not extend above the pastern. The judges may request to observe the area covered by the attached strap, keeper, gaiter, or accessory. Protective devices, such as bell boots, splint boots or wraps, are not permissible on the legs of horses except as part of hoof sole protections as allowed under Section 5 E2. The leg is defined as all structures above and including the coronet. It's hard to imagine every scenario that might come up. Feel free to ask questions of your particular judge. Question: I'm confused about the correct way to ride up hills. I see a lot of different postures - what's the best way to help your horse up the hill? The ascents and descents present a multitude of ways for the horse and rider to excel. Regardless of whether it is a mountain or a creek bank, the judges will be looking for the same things. 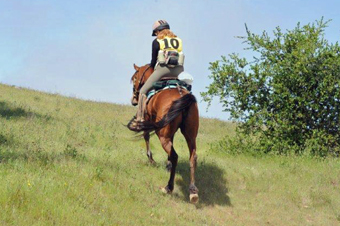 The horse should proceed with calm deliberation at a consistent pace, carefully placing its feet and going straight up or down the trail when asked. The horse might lose points for "crabbing" sideways going up or down, rushing, crowding another rider, being excessively nervous, or tossing its head. For the rider, leg position is of paramount importance. Ideally this position is one that if the horse were to suddenly evaporate from under you, you would land upright, on your feet. There is a "window" of good upper body position. If you lean too far back or are too far forward over the neck, you will make the horse's job more difficult. If you are too far out of the saddle, you sacrifice stability and safety. You should fold slightly forward from the hips (that does not mean bend at the waist) in an amount appropriate for the slope of the hill and the speed of the horse. Support yourself by rolling up onto your inner thighs so you can have your seat lightly off the saddle to make it easier for the horse to get its rear legs under it for upward push. It is permissible to take a handful of mane to steady yourself as long as it doesn't interfere with the rein control. The reins should be short enough to guide your horse easily, but long enough that he can get his head down for balance on the climb. Maintain your form and control to the top of the hill. It takes muscle tone and coordination that come only with practice. The judge will interpret how well you're moving with your horse. The best way to help your horse, as always, is for you to stay balanced and light in the saddle. Jan Jeffers shows good form riding uphill. Question: How do judges break ties? Many competitors believe the judges just look at the "pluses and minuses" on the cards, and the one with the most pluses breaks the tie. This is not completely accurate. There is much more involved and counting plus and minus signs is usually the last resort. The plus sign and minus sign are often used to be sure the rider understands positive versus negative comments. The plus does not mean points added-that can't be done! These are the guidelines for the horsemanship judges in the Judges' Manual on breaking ties: "Often a brief comparison of the tying scorecards serves readily to break a tie-for example, when one card shows several comments about the rider's excellence, but the other does not. If both cards appear equal in their notations of excellence, but one shows more of them for the major category of equitation-or a higher overall score in equitation-the judge can base the tie-break on that." For horses, the Judges Manual reads: "A horse that has a better condition and soundness score should be moved ahead. If horses are still tied, an overall look at the P&R's and metabolic parameters might tell you which horse is in the better condition. However, do not work the horses again to break a tie." If the scores are equal in all categories, for horse or rider, the judge must consider the relative importance of each observation and the comments for each. For example, a point lost for questionable soundness might be considered of more importance than a point lost for forgeing. Or, in the case of the riders, a point lost for a safety issue would be of more significance than a point lost for grooming. Sometimes a consultation with the other judge will help by gaining additional information or simply another viewpoint. When the tie is broken, the scores must clearly indicate the winner for the use of the national office. For example a three-way tie, when resolved, might be indicated with a 95+, 95 and 95-. Jamie Dieterich, a Region 1 Horsemanship Judge, has provided us with a couple of high-level articles about what judges are looking for in general, and how to approach a ride to meet the judge's expectations.